For a while I was dreaming about being in a doorway with piles of shoes. When I look at this I have two interpretations of the piece. The first time I looked at the piece I sort of saw Marxist feminism. The look on the woman face is sad and she is clenching to shoes which women love to have, but because of capitalism she is wishing she owned all of them, but is oppressed by capitalism and doesn't have private ownership or the means of production for this good. And then I looked at it again and I see the opposite of Marxist feminism, possibly Socialist feminism if there was such at thing. The woman has over come capitalism and now has the means to purchase all these shoes,which makes her equal to men in owning something. Marxist feminism is what i see here. When i look at this picture i see a woman who is obsessed with shoes. All she wants is shoes. Though she has a collection in front of her, she clenches the shoes tightly because she fears she will lose them. To me, the shoes represent money because she would need money to buy them. 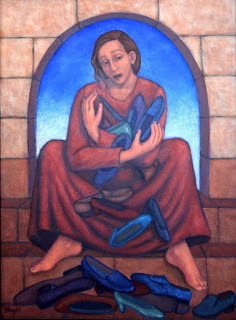 Society and "the man" have made her think that she needs to have lots of shoes to be happy, so now that she has them she is confused because she is still sad.